^ a b c Mallama, A.; Hilton, J.L. (2018). “Computing Apparent Planetary Magnitudes for The Astronomical Almanac”. Astronomy and Computing 25: 10–24. arXiv:1808.01973. Bibcode: 2018A&C....25...10M. doi:10.1016/j.ascom.2018.08.002. ^ a b c d Seidelmann, P. Kenneth; Archinal, Brent A.; A'Hearn, Michael F.; Conrad, Albert R.; Consolmagno, Guy J.; Hestroffer, Daniel; Hilton, James L.; Krasinsky, Georgij A. et al. (2007). “Report of the IAU/IAG Working Group on cartographic coordinates and rotational elements: 2006”. Celestial Mechanics and Dynamical Astronomy 98 (3): 155–180. Bibcode: 2007CeMDA..98..155S. doi:10.1007/s10569-007-9072-y. ^ Pearl et al., J. C. (1991). “The albedo, effective temperature, and energy balance of Neptune, as determined from Voyager data”. J. Geophys. Res. 96: 18,921–18,930. Bibcode: 1991JGR....9618921P. doi:10.1029/91JA01087. ^ Mallama, Anthony; Krobusek, Bruce; Pavlov, Hristo (2017). “Comprehensive wide-band magnitudes and albedos for the planets, with applications to exo-planets and Planet Nine”. Icarus 282: 19–33. arXiv:1609.05048. Bibcode: 2017Icar..282...19M. doi:10.1016/j.icarus.2016.09.023. ^ Walter, Elizabeth (2003-04-21). Cambridge Advanced Learner's Dictionary (2nd ed.). ISBN 978-0-521-53106-1. ^ Podolak, M.; Weizman, A.; Marley, M. (1995). “Comparative models of Uranus and Neptune”. Planetary and Space Science 43 (12): 1517–1522. Bibcode: 1995P&SS...43.1517P. doi:10.1016/0032-0633(95)00061-5. ^ a b c d e f g h i j Lunine, Jonathan I. (1993). “The Atmospheres of Uranus and Neptune”. Annual Review of Astronomy and Astrophysics 31: 217–263. Bibcode: 1993ARA&A..31..217L. doi:10.1146/annurev.aa.31.090193.001245. ^ a b Suomi, V. E.; Limaye, S. S.; Johnson, D. R. (1991). “High Winds of Neptune: A possible mechanism”. Science 251 (4996): 929–932. Bibcode: 1991Sci...251..929S. doi:10.1126/science.251.4996.929. PMID 17847386. ^ a b c d e Hubbard, W. B. (1997). “Neptune's Deep Chemistry”. Science 275 (5304): 1279–1280. doi:10.1126/science.275.5304.1279. PMID 9064785. ^ a b c Airy, G. B. (1846). “Account of some circumstances historically connected with the discovery of the planet exterior to Uranus”. Monthly Notices of the Royal Astronomical Society 7 (10): 121–144. Bibcode: 1846MNRAS...7..121A. doi:10.1002/asna.18470251002. ^ Adams, J. C. (1846). “Explanation of the observed irregularities in the motion of Uranus, on the hypothesis of disturbance by a more distant planet”. Monthly Notices of the Royal Astronomical Society 7 (9): 149–152. Bibcode: 1846MNRAS...7..149A. doi:10.1093/mnras/7.9.149. ^ Challis, Rev. J. (1846). “Account of observations at the Cambridge observatory for detecting the planet exterior to Uranus”. Monthly Notices of the Royal Astronomical Society 7 (9): 145–149. Bibcode: 1846MNRAS...7..145C. doi:10.1093/mnras/7.9.145. ^ Galle, J. G. (1846). 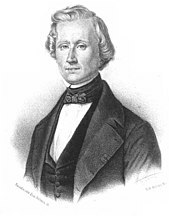 “Account of the discovery of Le Verrier's planet Neptune, at Berlin, Sept. 23, 1846”. Monthly Notices of the Royal Astronomical Society 7 (9): 153. Bibcode: 1846MNRAS...7..153G. doi:10.1093/mnras/7.9.15. ^ William Sheehan; Nicholas Kollerstrom; Craig B. Waff (2004). “The Case of the Pilfered Planet – Did the British steal Neptune?”. Scientific American. 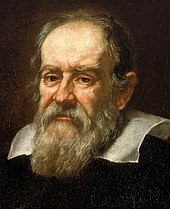 http://www.scientificamerican.com/article.cfm?id=the-case-of-the-pilfered 2019年3月1日閲覧。. ^ Moore (2000), p. 206. ^ Baum, Richard; Sheehan, William (2003). In Search of Planet Vulcan: The Ghost in Newton's Clockwork Universe. Basic Books. pp. 109–110. ISBN 978-0-7382-0889-3. ^ Gingerich, Owen (1958). “The Naming of Uranus and Neptune”. Astronomical Society of the Pacific Leaflets 8 (352): 9–15. Bibcode: 1958ASPL....8....9G. ^ Hind, J. R. (1847). 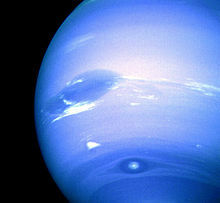 “Second report of proceedings in the Cambridge Observatory relating to the new Planet (Neptune)”. Astronomische Nachrichten 25 (21): 309–314. Bibcode: 1847AN.....25..309.. doi:10.1002/asna.18470252102. ^ “Greek Names of the Planets” (2010年4月25日). 2019年3月1日閲覧。 “Neptune or Poseidon as is its Greek name, was the God of the Seas. It is the eight planet from the sun...” See also the Greek article about the planet. ^ Weissman, Paul R. (1995). “The Kuiper Belt”. Annual Review of Astronomy and Astrophysics 33: 327–357. Bibcode: 1995ARA&A..33..327W. doi:10.1146/annurev.aa.33.090195.001551. ^ Unsöld, Albrecht; Baschek, Bodo (2001). The New Cosmos: An Introduction to Astronomy and Astrophysics (5th ed.). Springer. 47. Bibcode: 2001ncia.book.....U. ISBN 978-3-540-67877-9. See Table 3.1. ^ a b Boss, Alan P. (2002). “Formation of gas and ice giant planets”. Earth and Planetary Science Letters 202 (3–4): 513–523. Bibcode: 2002E&PSL.202..513B. doi:10.1016/S0012-821X(02)00808-7. ^ Atreya, S.; Egeler, P.; Baines, K. (2006). “Water-ammonia ionic ocean on Uranus and Neptune?”. Geophysical Research Abstracts 8: 05179. http://www.cosis.net/abstracts/EGU06/05179/EGU06-J-05179-1.pdf. ^ Kerr, Richard A. (1999). “Neptune May Crush Methane Into Diamonds”. Science 286 (5437): 25a–25. doi:10.1126/science.286.5437.25a. PMID 10532884. ^ Kraus, D.; Vorberger, J.; Pak, A.; Hartley, N. J.; Fletcher, L. B.; Frydrych, S.; Galtier, E.; Gamboa, E. J. et al. (2017). “Formation of diamonds in laser-compressed hydrocarbons at planetary interior conditions”. Nature Astronomy 1 (9): 606–611. Bibcode: 2017NatAs...1..606K. doi:10.1038/s41550-017-0219-9. http://www.escholarship.org/uc/item/1zd805nx. ^ Bradley, D. K.; Eggert, J. H.; Hicks, D. G.; Celliers, P. M. (2004). “Shock Compressing Diamond to a Conducting Fluid” (PDF). Physical Review Letters 93 (19): 195506. Bibcode: 2004PhRvL..93s5506B. doi:10.1103/physrevlett.93.195506. PMID 15600850. https://e-reports-ext.llnl.gov/pdf/310197.pdf. ^ Eggert, J.H. ; Hicks, D. G.; Celliers, P. M.; Bradley, D. K. et al. (2009). “Melting temperature of diamond at ultrahigh pressure”. Nature Physics 6 (40): 40–43. Bibcode: 2010NatPh...6...40E. doi:10.1038/nphys1438. http://www.nature.com/nphys/journal/v6/n1/abs/nphys1438.html. ^ a b Encrenaz, Thérèse (2003). “ISO observations of the giant planets and Titan: what have we learnt?”. 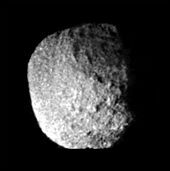 Planetary and Space Science 51 (2): 89–103. Bibcode: 2003P&SS...51...89E. doi:10.1016/S0032-0633(02)00145-9. ^ Broadfoot, A. L.; Atreya, S. K.; Bertaux, J. L. et al. (1999). “Ultraviolet Spectrometer Observations of Neptune and Triton” (PDF). Science 246 (4936): 1459–1466. Bibcode: 1989Sci...246.1459B. doi:10.1126/science.246.4936.1459. PMID 17756000. http://www-personal.umich.edu/~atreya/Articles/1989_Voyager_UV_Spectrometer.pdf. ^ Herbert, Floyd; Sandel, Bill R. (1999). 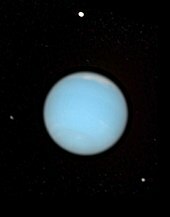 “Ultraviolet observations of Uranus and Neptune”. Planetary and Space Science 47 (8–9): 1119–1139. Bibcode: 1999P&SS...47.1119H. doi:10.1016/S0032-0633(98)00142-1. ^ Stanley, Sabine; Bloxham, Jeremy (2004). “Convective-region geometry as the cause of Uranus' and Neptune's unusual magnetic fields”. Nature 428 (6979): 151–153. Bibcode: 2004Natur.428..151S. doi:10.1038/nature02376. PMID 15014493. ^ Connerney, J. E. P.; Acuña, Mario H.; Ness, Norman F. (1991). “The magnetic field of Neptune”. Journal of Geophysical Research 96: 19023–19042. Bibcode: 1991JGR....9619023C. doi:10.1029/91JA01165. ^ a b Ness, N. F.; Acuña, M. H.; Burlaga, L. F.; Connerney, J. E. P.; Lepping, R. P.; Neubauer, F. M. (1989). “Magnetic Fields at Neptune”. Science 246 (4936): 1473–1478. Bibcode: 1989Sci...246.1473N. doi:10.1126/science.246.4936.1473. PMID 17756002. ^ Hammel, H. B.; Beebe, R. F.; De Jong, E. M.; Hansen, C. J.; Howell, C. D.; Ingersoll, A. P.; Johnson, T. V.; Limaye, S. S. et al. (1989). “Neptune's wind speeds obtained by tracking clouds in Voyager 2 images”. Science 24 (4924): 1367–1369. Bibcode: 1989Sci...245.1367H. doi:10.1126/science.245.4924.1367. PMID 17798743. ^ a b Burgess (1991), pp. 64-70. ^ Orton, G. S.; Encrenaz T.; Leyrat C.; Puetter, R.; Friedson, A. J. (2007). “Evidence for methane escape and strong seasonal and dynamical perturbations of Neptune's atmospheric temperatures”. Astronomy and Astrophysics 473 (1): L5–L8. Bibcode: 2007A&A...473L...5O. doi:10.1051/0004-6361:20078277. ^ a b c d e 渡辺潤一 (2012), pp. 172-173. ^ Hammel, H. B.; Lockwood, G. W.; Mills, J. R.; Barnet, C. D. (1995). 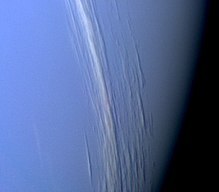 “Hubble Space Telescope Imaging of Neptune's Cloud Structure in 1994”. Science 268 (5218): 1740–1742. Bibcode: 1995Sci...268.1740H. doi:10.1126/science.268.5218.1740. PMID 17834994. ^ S. G., Gibbard; de Pater, I.; Roe, H. G.; Martin, S.; Macintosh, B. A.; Max, C. E. (2003). “The altitude of Neptune cloud features from high-spatial-resolution near-infrared spectra” (PDF). Icarus 166 (2): 359–374. Bibcode: 2003Icar..166..359G. doi:10.1016/j.icarus.2003.07.006. オリジナルの2012-02-20時点によるアーカイブ。. https://web.archive.org/web/20120220052413/http://cips.berkeley.edu/research/depater_altitude.pdf. ^ a b Max, C. E.; Macintosh, B. A.; Gibbard, S. G.; Gavel, D. T.; Roe, H. G.; de Pater, I.; Ghez, A. M.; Acton, D. S. et al. (2003). “Cloud Structures on Neptune Observed with Keck Telescope Adaptive Optics”. The Astronomical Journal 125 (1): 364–375. Bibcode: 2003AJ....125..364M. doi:10.1086/344943. ^ Stratman, P. W.; Showman, A. P.; Dowling, T. E.; Sromovsky, L. A. (2001). “EPIC Simulations of Bright Companions to Neptune's Great Dark Spots” (PDF). Icarus 151 (2): 275–285. Bibcode: 1998Icar..132..239L. doi:10.1006/icar.1998.5918. http://www.lpl.arizona.edu/~showman/publications/stratman-etal-2001.pdf. ^ Sromovsky, L. A.; Fry, P. M.; Dowling, T. E.; Baines, K. H. (2000). 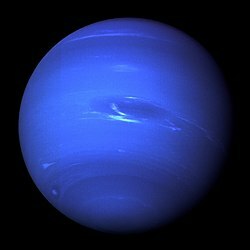 “The unusual dynamics of new dark spots on Neptune”. Bulletin of the American Astronomical Society 32: 1005. Bibcode: 2000DPS....32.0903S. ^ Lindal, Gunnar F. (1992). “The atmosphere of Neptune – an analysis of radio occultation data acquired with Voyager 2”. Astronomical Journal 103: 967–982. Bibcode: 1992AJ....103..967L. doi:10.1086/116119. ^ Pearl, J. C.; Conrath, B. J. (1991). “The albedo, effective temperature, and energy balance of Neptune, as determined from Voyager data”. Journal of Geophysical Research: Space Physics 96: 18921–18930. Bibcode: 1991JGR....9618921P. doi:10.1029/91ja01087. ^ a b Anonymous (2007年11月16日). “Horizons Output for Neptune 2010–2011”. 2013年5月2日時点のオリジナルよりアーカイブ。2008年2月25日閲覧。 —Numbers generated using the Solar System Dynamics Group, Horizons On-Line Ephemeris System. ^ Hubbard, W. B.; Nellis, W. J.; Mitchell, A. C.; Holmes, N. C.; McCandless, P. C.; Limaye, S. S. (1991). “Interior Structure of Neptune: Comparison with Uranus”. Science 253 (5020): 648–651. Bibcode: 1991Sci...253..648H. doi:10.1126/science.253.5020.648. PMID 17772369. ^ Stern, S. Alan; Colwell, Joshua E. (1997). “Collisional Erosion in the Primordial Edgeworth-Kuiper Belt and the Generation of the 30–50 AU Kuiper Gap”. The Astrophysical Journal 490 (2): 879–882. Bibcode: 1997ApJ...490..879S. doi:10.1086/304912. ^ Petit, Jean-Marc; Morbidelli, Alessandro; Valsecchi, Giovanni B. (1999). “Large Scattered Planetesimals and the Excitation of the Small Body Belts” (PDF). Icarus 141 (2): 367–387. Bibcode: 1999Icar..141..367P. doi:10.1006/icar.1999.6166. オリジナルの2007-12-01時点によるアーカイブ。. https://web.archive.org/web/20071201013047/http://www.oca.eu/morby/papers/6166a.pdf. ^ Varadi, F. (1999). “Periodic Orbits in the 3:2 Orbital Resonance and Their Stability”. The Astronomical Journal 118 (5): 2526–2531. Bibcode: 1999AJ....118.2526V. doi:10.1086/301088. ^ Chiang, E. I.; Jordan, A. B.; Millis, R. L.; M. W. Buie; Wasserman, L. H.; Elliot, J. L.; Kern, S. D.; Trilling, D. E. et al. (2003). “Resonance Occupation in the Kuiper Belt: Case Examples of the 5 : 2 and Trojan Resonances”. The Astronomical Journal 126 (1): 430–443. arXiv:astro-ph/0301458. Bibcode: 2003AJ....126..430C. doi:10.1086/375207. ^ Sheppard, Scott S.; Trujillo, Chadwick A. (2010). “Detection of a Trailing (L5) Neptune Trojan”. Science 329 (5997): 1304. Bibcode: 2010Sci...329.1304S. doi:10.1126/science.1189666. PMID 20705814. ^ a b De La Fuente Marcos, C.; De La Fuente Marcos, R. (2012). 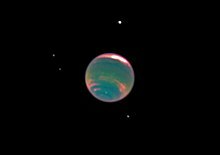 “(309239) 2007 RW10: a large temporary quasi-satellite of Neptune”. Astronomy and Astrophysics Letters 545 (2012): L9. arXiv:1209.1577. Bibcode: 2012A&A...545L...9D. doi:10.1051/0004-6361/201219931. ^ Thommes, Edward W.; Duncan, Martin J.; Levison, Harold F. (2002). “The formation of Uranus and Neptune among Jupiter and Saturn”. The Astronomical Journal 123 (5): 2862–2883. arXiv:astro-ph/0111290. Bibcode: 2002AJ....123.2862T. doi:10.1086/339975. ^ Crida, A.title=Solar System formation (2009). Reviews in Modern Astronomy 21: 3008. arXiv:0903.3008. Bibcode: 2009RvMA...21..215C. doi:10.1002/9783527629190.ch12. ISBN 978-3-527-62919-0. ^ Desch, S. J. (2007). “Mass Distribution and Planet Formation in the Solar Nebula”. The Astrophysical Journal 671 (1): 878–893. Bibcode: 2007ApJ...671..878D. doi:10.1086/522825. ^ Smith, R.; L. J. Churcher; M. C. Wyatt; M. M. Moerchen; C. M. Telesco (2009). “Resolved debris disc emission around η Telescopii: a young solar system or ongoing planet formation?”. Astronomy and Astrophysics 493 (1): 299–308. arXiv:0810.5087. Bibcode: 2009A&A...493..299S. doi:10.1051/0004-6361:200810706. ^ Hubble Space Telescope discovers fourteenth tiny moon orbiting Neptune | Space, Military and Medicine. News.com.au (16 July 2013). Retrieved on 1 March 2019. ^ Agnor, Craig B.; Hamilton, Douglas P. (2006). 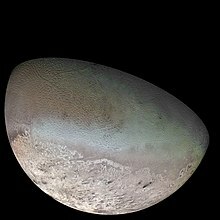 “Neptune's capture of its moon Triton in a binary–planet gravitational encounter”. Nature 441 (7090): 192–194. Bibcode: 2006Natur.441..192A. doi:10.1038/nature04792. PMID 16688170. ^ Chyba, Christopher F.; Jankowski, D. G.; Nicholson, P. D. (1989). “Tidal evolution in the Neptune-Triton system”. Astronomy and Astrophysics 219 (1–2): L23–L26. Bibcode: 1989A&A...219L..23C. ^ Nelson, R. M.; Smythe, W. D.; Wallis, B. D.; Horn, L. J.; Lane, A. L.; Mayo, M. J. (1990). “Temperature and Thermal Emissivity of the Surface of Neptune's Satellite Triton”. Science 250 (4979): 429–431. Bibcode: 1990Sci...250..429N. doi:10.1126/science.250.4979.429. PMID 17793020. ^ a b Stone, E. C.; Miner, E. D. (1989). “The Voyager 2 Encounter with the Neptunian System”. Science 246 (4936): 1417–1421. Bibcode: 1989Sci...246.1417S. doi:10.1126/science.246.4936.1417. PMID 17755996. ^ 渡辺潤一 (2012), p. 174. ^ Holman, M. J.; Kavelaars, J. J.; Grav, T.; Gladman, B. J.; Fraser, W. C.; Milisavljevic, D.; Nicholson, P. D.; Burns, J. A. et al. (2004). “Discovery of five irregular moons of Neptune” (PDF). Nature 430 (7002): 865–867. Bibcode: 2004Natur.430..865H. doi:10.1038/nature02832. PMID 15318214. https://www.cfa.harvard.edu/~mholman/nature_final.pdf. ^ Guinan, E. F.; Harris, C. C.; Maloney, F. P. (1982). “Evidence for a Ring System of Neptune”. Bulletin of the American Astronomical Society 14: 658. Bibcode: 1982BAAS...14..658G. ^ Goldreich, P.; Tremaine, S.; Borderies, N. E. F. (1986). “Towards a theory for Neptune's arc rings”. Astronomical Journal 92: 490–494. Bibcode: 1986AJ.....92..490G. doi:10.1086/114178. ^ Nicholson, P. D. et al. (1990). “Five Stellar Occultations by Neptune: Further Observations of Ring Arcs”. Icarus 87 (1): 1–39. Bibcode: 1990Icar...87....1N. doi:10.1016/0019-1035(90)90020-A. ^ Salo, Heikki; Hänninen, Jyrki (1998). 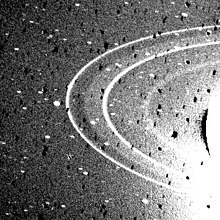 “Neptune's Partial Rings: Action of Galatea on Self-Gravitating Arc Particles”. Science 282 (5391): 1102–1104. Bibcode: 1998Sci...282.1102S. doi:10.1126/science.282.5391.1102. PMID 9804544. ^ dePater, Imke; Gibbard, Seren et al. (2005). “The Dynamic Neptunian Ring Arcs: Evidence for a Gradual Disappearance of Liberté and Resonant Jump of Courage”. Icarus 174 (1): 263–272. Bibcode: 2005Icar..174..263D. doi:10.1016/j.icarus.2004.10.020. http://astro.berkeley.edu/~echiang/ppp/nepring.pdf. ^ Richard W. Schmude Jr.; Ronald E. Baker; Jim Fox; Bruce A. Krobusek; Hristo Pavlov; Anthony Mallama (2016年4月2日). “The Secular and Rotational Brightness Variations of Neptune”. arXiv:1604.00518v1 [astro-ph.EP]. Bibcode: 2016arXiv160400518S. ^ Moore (2000), p. 207. ^ In 1977, for example, even the rotation period of Neptune remained uncertain. Cruikshank, D. P. (1978). “On the rotation period of Neptune”. Astrophysical Journal Letters 220: L57–L59. Bibcode: 1978ApJ...220L..57C. doi:10.1086/182636. ^ Max, C.; MacIntosh, B.; Gibbard, S.; Roe, H.; De Pater, I.; Ghez, A.; Acton, S.; Wizinowich, P. et al. (1999). 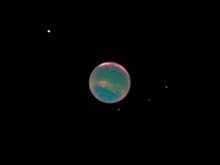 “Adaptive Optics Imaging of Neptune and Titan with the W.M. Keck Telescope”. Bulletin of the American Astronomical Society 31: 1512. Bibcode: 1999AAS...195.9302M. ^ Nemiroff, R.; Bonnell, J., eds. (2000-02-18). "Neptune through Adaptive Optics". Astronomy Picture of the Day. NASA. ^ Gibbard, S. G.; Roe, H.; de Pater, I.; Macintosh, B.; Gavel, D.; Max, C. E.; Baines, K. H.; Ghez, A. (1999). 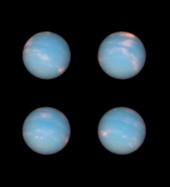 “High-Resolution Infrared Imaging of Neptune from the Keck Telescope”. Icarus 156 (1): 1–15. Bibcode: 2002Icar..156....1G. doi:10.1006/icar.2001.6766. ^ a b Burgess (1991), pp. 46-55. ^ Tom Standage (2000). The Neptune File: A Story of Astronomical Rivalry and the Pioneers of Planet Hunting. New York: Walker. p. 188. 978-0-8027-1363-6. ^ Spilker, T. R.; Ingersoll, A. P. (2004). “Outstanding Science in the Neptune System From an Aerocaptured Vision Mission”. Bulletin of the American Astronomical Society 36: 1094. Bibcode: 2004DPS....36.1412S.